Can decluttering your home really change your life? Can decluttering your home really change your life? That's the promise behind the international best-seller The Life-Changing Magic of Tidying Up ($17, amazon.com) by Japanese "organizational consultant" Marie Kondo. I first heard about this little book from my friend Amanda, a personal organizer here in New York City, but since then it's basically taken over the internet, from the New York Times to the Huffington Post to Real Simple—to Netflix. Kondo promises that radically purging your stuff will not only make it easier to put together a decent outfit, it will actually transform your life. By clearing out objects that weigh you down mentally and emotionally, you'll make space for new people, things, and experiences. Kondo says that some of her clients have even lost weight or had their skin clear up, possibly due to the "detoxifying" effects of purging your home. Sounds too good to be true? I tried her methods myself, and while I haven't experienced any miraculous effects (yet! ), I can say that it has made me a whole lot happier in my home. Here's what I learned. This is Kondo's central guiding principle. Take everything you own—"every sock, every shirt, every tube of toothpaste, every single book, everything"—into your hand and ask yourself: Does this spark joy? If it does, keep it. If not, ditch it. It's a surprisingly useful gauge. Using joy as a metric, I got rid of not only worn-out T-shirts and pants that haven't fit me in years, but perfectly good sweaters that I'm just "meh" about. It's amazing how different it feels opening my closet in the morning knowing that every single thing in it is something I'd be delighted to put on. Most of us clean up in dribs and drabs, ”tossing a few items of clothing when we switch over our winter to summer wardrobes," say, or suddenly getting the urge to reorganize the medicine cabinet once or twice a year. The problem with this, Kondo says, is that it's too easy to backslide. "Tidying is a special event," Kondo writes. "Don't do it every day." 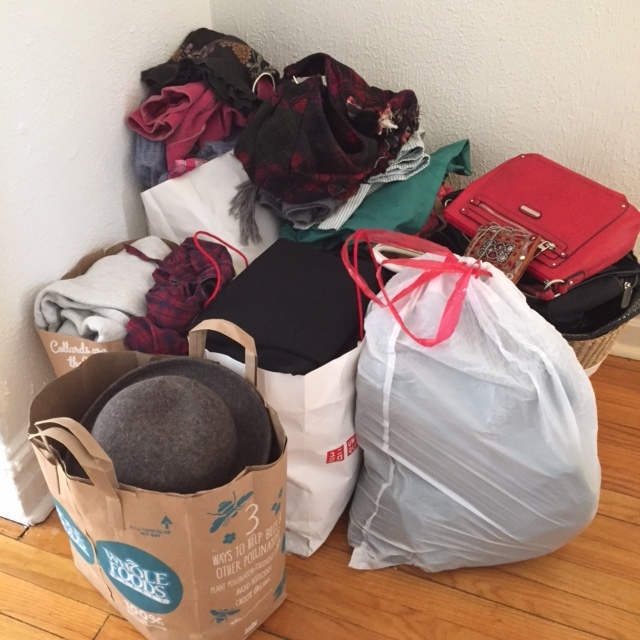 Instead, she says, do all your throwing out at once, by category of stuff: Start with your clothes (the easiest category to purge), piling every item of clothing you own on the floor and going through them one by one. Then move on to books, then papers, then miscellaneous (DVDs, makeup, stationery, electronics, etc. ), then finally mementos (the hardest category). Once you're done, Kondo says, maintaining this "state of perfect order" will be a snap and you'll never have to purge again. In fact, she says she has had zero repeat clients. If this sounds daunting, know that you're not doing it all in one day! Kondo says that the whole process takes her clients around six months. I had to break down clothing alone into multiple subcategories and do it over the course of three weekends. At the end, I had nine big bags of clothes to donate, probably amounting to more than half my wardrobe. I have tons of things that I hang onto mainly out of guilt (I spent too much money on that! It was a gift!). As the daughter of Korean War survivors who have turned frugality into a high art form, I especially have trouble getting rid of things that are "perfectly good" or "might be useful someday," even if they do nothing for me but take up space. But Kondo writes, "When you come across something that you cannot part with, think carefully about its true purpose in your life. You'll be surprised at how many of the things you possess have already fulfilled their role." That necklace you loved in the store but never wear, for example, served its purpose of giving you a thrill when you bought it. The hideous vase your aunt gave you as a wedding gift has done the job of conveying your aunt's love and good wishes for you. It's okay to let it go now. By now you've probably seen Kondo folding T-shirts and even socks and underwear into perfect little rectangles that can stand up on edge. The idea here is that clothing actually gets less wrinkled when it's not piled up (think of that poor smushed sweater at the bottom of a tall teetering stack) and that everything is easier to access when it's "filed" vertically in drawers. Kondo also talks about how folding clothing properly transfers energy to the fabric, making it "stronger and more vibrant." 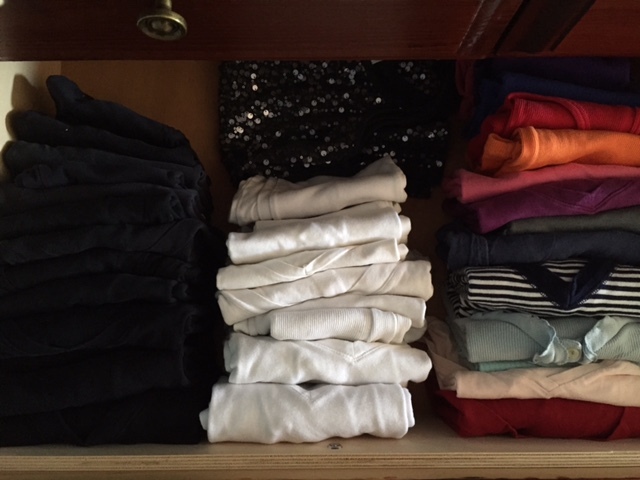 I don't know about that; I just know I am so tickled by the sight of all my T-shirts lined up in perfect rows that I sometimes open my drawers just to admire them. 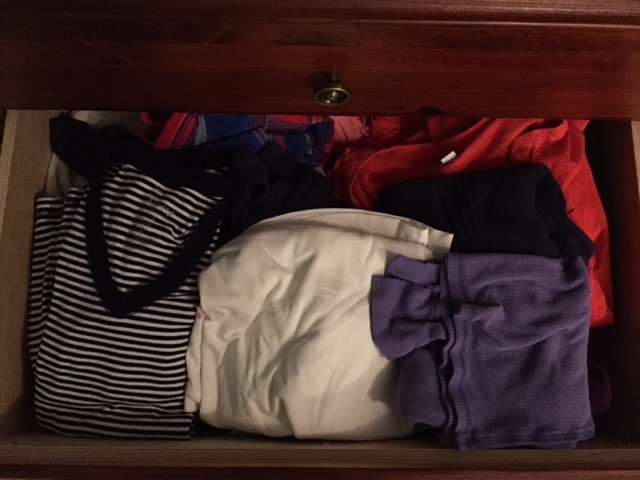 I'm not the only one: Do a quick search for #KonMari (the name of Kondo's method) on Twitter or Instagram to see the legions of drawer "after" photos taken by proud tidiers. When you decide to get organized, is your first stop to The Container Store to stock up on shelving units and fun little drawer dividers and cool nesting baskets? Stop right there. "Clutter is caused by a failure to return things to where they belong," Kondo writes. "Therefore, storage should reduce the effort needed to put things away, not the effort needed to get them out." I am not exaggerating when I say that this totally blew my mind. I can't say that I've attained tidiness perfection yet (far from it, my family would probably say), but the pleasure I've already gained from Kondo's methods has made me a convert. I'm devoting a few months' worth of weekends more to "tidying," and looking forward to the total transformation when I'm done.